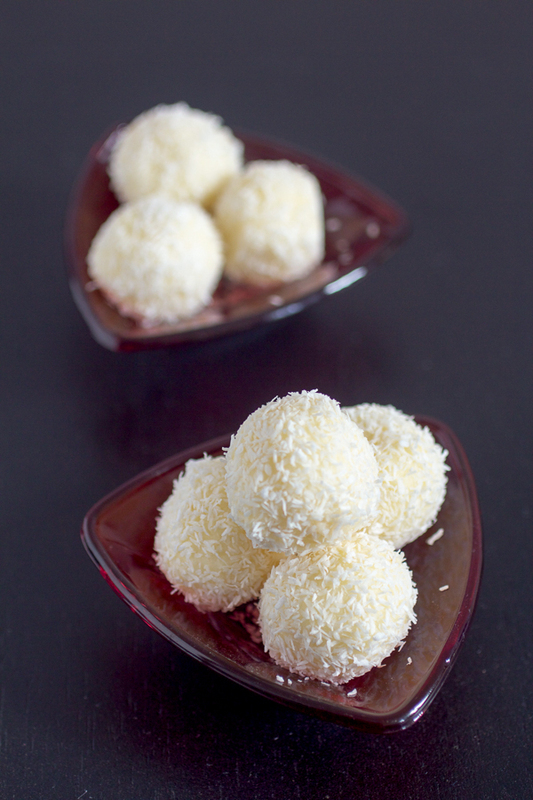 Easiest and most delicious Coconut Raffaello Balls recipe in the world. I promise! 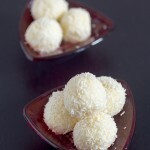 I liked many chocolate bars as a kid, but one of my absolute favorites were little Raffaello balls. 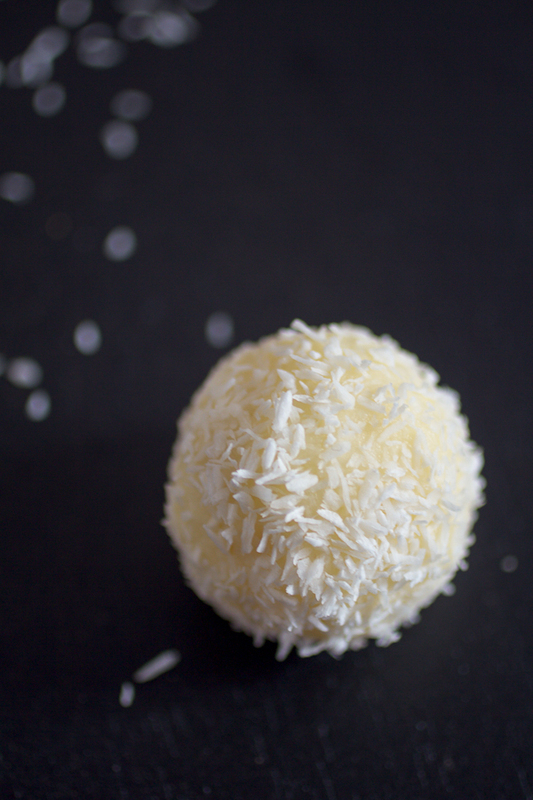 You know the kind: small, coconut-y, they come in a package of threes. They have a little crunch when you bite in, this is a little wafer covered with shredded coconut. But the best part is the middle. Smooth, soft, creamy, sweet, hiding inside itself an almond. Well I’ve discovered the recipe for Raffaello balls that go straight to that middle part. And it’s perfect. And now we’ll make it together. These are great for when you have guests the same evening, and you’re wondering what to do for dessert. As long as you have a few of these ingredients you’re good to go. They’re also fun to do for a holiday, keeping up to a week in the fridge. Great to bring to a picnic, or a school event. And most importantly, you are sure to impress your family with these. As the recipe is short, I won’t keep you waiting. One thing I’ll recommend is to get blanched almonds, also known as almonds without skin. Or you can make them yourself. P.S. Other truffle like desserts on the site include the fig rum and the chocolate-hazelnut truffles. I am also impartial to the chocolate cake rolls. Put 10 tbsp of milk in a bowl. Add the pudding mix and sugar. Mix well until integrated. Pour the remaining milk into a pot and bring to boil on medium. As it starts to boil, bring the temperature down to the lowest setting, and add in the pudding mixture. Mix thoroughly and frequently until pudding forms (about 10 minutes). Turn heat off and let cool. When pudding is lukewarm, cut the butter up and add in. Follow this up with 7 ounces of shredded coconut flour (flakes). 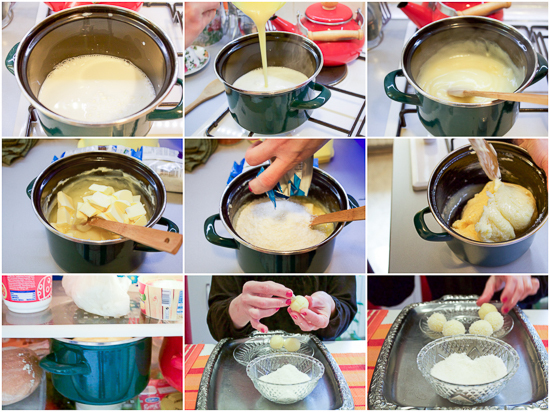 Continue stirring everything until you get one smooth, thick, sticky mass. Transfer to fridge and cool down completely (30 minutes). Pour 4 ounces of shredded coconut in a bowl. 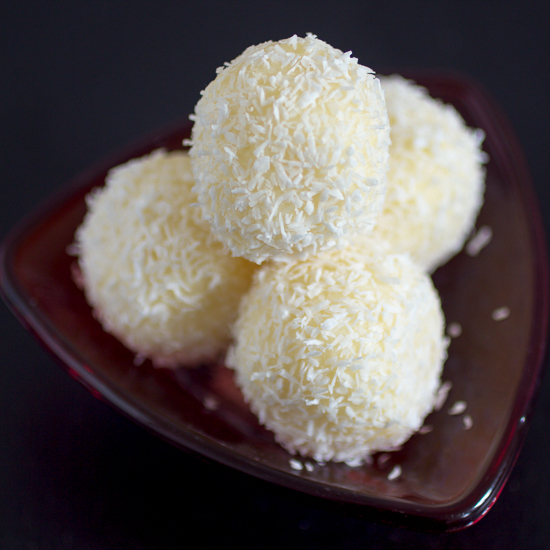 Take Raffaello mass out of the fridge and form balls the size of a golf ball or smaller (smaller are better). 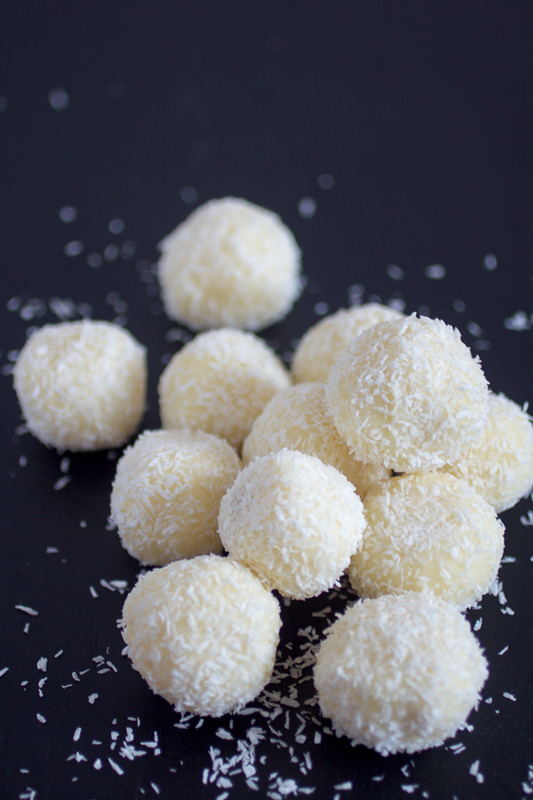 Put an almond into each ball, and then dip each in shredded coconut. About 40 to 50 balls come out with this volume. You may have more or less depending on how large you shape the Rafaello balls. Serving size is 2. They kind of do, don’t they? Hello! What’s shredded coconut flour is? Can I use usual coconut flour? Also I want to use cornstarch instead of pudding mix, how much should I use? Thanks! Shredded coconut flakes. Look for it in the international aisle at your grocery store. Not sure about cornstarch, never used it. Good luck Lera. Yummy! Does it matter whether or not I use instant pudding mix or the cooked version? Thanks Karen. You’ll have to use the instant pudding mix. However if you experiment with the other kind let us know how it turns out. It states coconut flour, but i don’t see any coconut flour in the other recipe?